A beautiful smile is something we all want to have, but there can be several factors holding us back from being truly proud of our teeth. If you need some help to achieve your best-ever smile, follow these tips from the Edinburgh dentists at New Town Dental Care. The first step to perfect teeth is simple, and something we should all being doing anyway… brushing our teeth regularly. Everyone should brush their teeth twice a day, regardless of how busy they are. Even if you come home late, you should remember to brush your teeth before getting into bed. Two minutes in front of the mirror is all it takes, to make sure that you’re getting rid of any leftover food particles and eradicating any debris which can lead to plaque or tooth decay. If you’re concerned that you won’t remember, leave yourself a note on your pillow or your mirror to remind you to head back to the bathroom and brush your teeth before you roll into bed. According to Dr Jonathan Hiscocks, one of our fantastic Edinburgh dentists, it’s not a case of ‘any brush will do’. Most adults require a small or medium sized toothbrush, so that there’s a head and bristles small enough to reach right to the very back teeth and ensure your whole mouth has been cleaned. An electric toothbrush is preferable, as the oscillating bristles are far more effective at cleaning your teeth. To make sure that your smile is looking its best, use a whitening toothpaste to reduce staining and enhance a sparkling smile. Before you head for the day, you should take a moment to floss. Edinburgh dentist Dr Alastair McGill reminds us that flossing is a key part of a dental hygiene routine, but so many peopleskip this step. To maximise effectiveness and ensure that your whole mouth is fresh and clean, use a piece of floss around 18 inches in length, allowing you to use a fresh area of floss with every stroke, and keep in mind that the floss should create a ‘c’ shape around each tooth, to effectively remove lingering bacteria from the sides, front and back of the tooth. You can also use the floss to scrape gently down the front of the teeth. Floss will make sure you have fresher breath too. Don’t waste your time on at-home whitening kits - the only way to go is towards your dentist, who can provide a safe and effective whitening treatment to give you a gleaming smile. We offer a range of teeth whitening options at Edinburgh’s New Town Dental Care so we can provide the best option for each patient. Teeth naturally darken as we age, which is often exacerbated by the absorption of colour from the food and drink we consume. This results in a less-than-perfect smile, which isn’t what most of us are looking for. 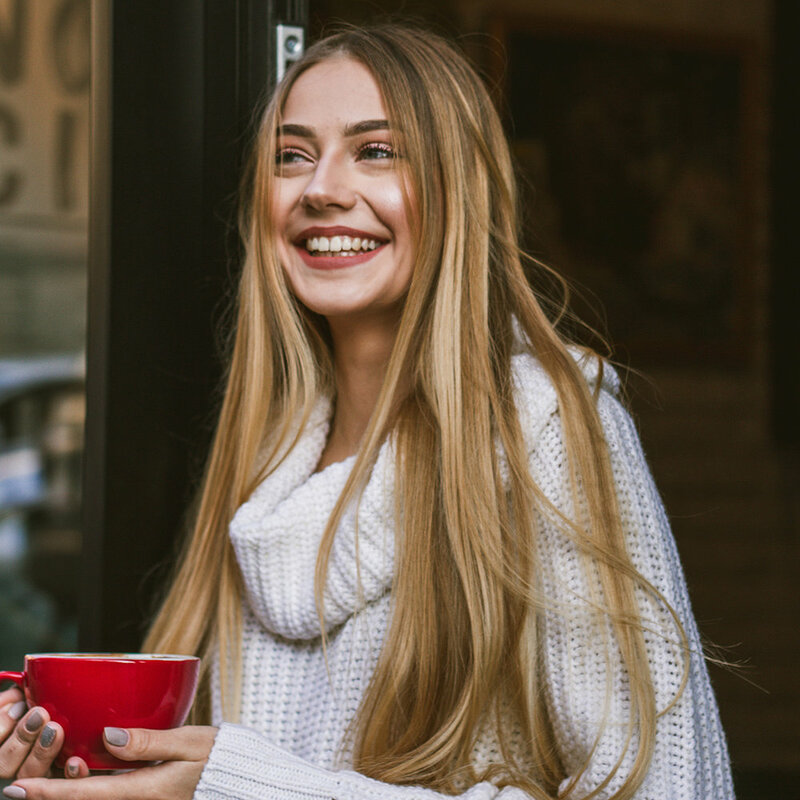 71% of under-30s believe that straight, white teeth is the most attractive trait a person can have, so it’s no surprise that whitening treatments are so popular in this age group. Having your teeth professionally whitened by your dentist is the safest and longest-lasting way to restore the brightness in your smile. However, whitening isn’t permanent, so you will need to factor in top-up appointments to maintain the whiteness of your smile. At-home whitening kits don’t contain the same concentration of ingredients that professional dentists can administer, meaning the results will not be as effective. Your dentist can also advise you on how to care for your whitened teeth, which foods to avoid and which products to use to maintain their new freshness. Still not completely happy with your smile? There’s plenty we can do to perfect your teeth! If you don’t like the appearance of your teeth, there are lots of options to consider - from Invisalign braces to straighten teeth, to veneers which can change the colour, shape, size and length of teeth. Whichever option you’re interested in, be sure to visit your dentist before going any further with treatments. They’ll be able to advise which options will be best for you, as well as give you an overview of costs, timelines and after-care. If you’re looking to improve your smile and need an Edinburgh dentist to help you, come and visit the team at New Town Dental Care. We’d be delighted to help you on your journey to your best-ever smile!